My background in international relations and interest in this area fuelled my interest in impact investment as a tool for international development. As an investment manager for a Hong Kong based impact investment fund and later as the investment lead for Synergy Social Ventures, an organization I co-founded, I was focused on investing in Southeast Asia and saw first hand the real power of entrepreneurship and patient capital to move the needle further than years of aid could. While there are challenges that can only be addressed by direct aid, there are also many where we can move from band-aid solutions to long-term solutions that are also financially sustainable. I’m excited about the new actors adopting impact investing as a tool for development and the new ways they are finding to collaborate and blend capital for greater impact. What are the trends linking international development + social impact and finance + business together? Social and environmental challenges in emerging markets are prime opportunities for market based and impact investing approaches. In these contexts there are many market failures that provide opportunities for business models that simultaneously address challenges such as access to basic needs including water, energy and healthcare. At the same time doing business and investing in emerging markets brings its own set of challenges and risks. Realizing the opportunities of impact investment in emerging markets requires a careful approach and collaboration among actors that don’t traditionally partner together. While not easy these are exciting opportunities to bring much more capital into international development philanthropy and aid funding ever could. What are some "must-reads" for anyone interested in impact investing within emerging markets? 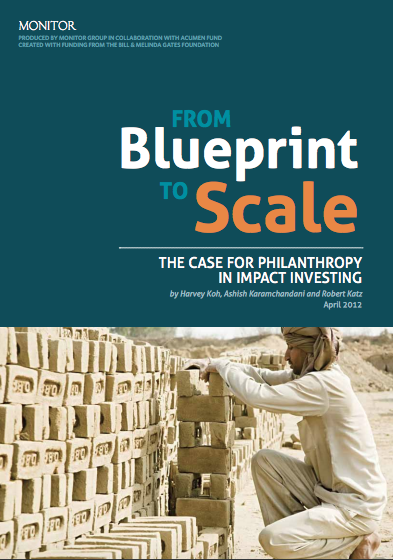 From Blueprint to Scale: The Case for Philanthropy in Impact Investing (Link): This report springs from a point of view shared by Monitor and Acumen Fund—that philanthropy is the essential but often overlooked catalyst that unlocks the impact potential of inclusive business and impact investing. Priming the Pump: The Case for a Sector Based Approach to Impact Investing (Link): The Omidyar Network’s Matt Bannick and Paula Goldman make the case that the impact investing sector should focus more on what is required to spark, nurture, and scale entire sectors for social change. Although investing in firms is an essential component to driving sector-level change, it is ultimately sector development that matters most. Frontier Capital: Early Stage Investing for Financial Returns and Social Impact in Emerging Markets (Link): At the convergence of impact investing and venture capital, Frontier Capital focuses on low to lower-middle income people in emerging markets. This report underlines the immense potential of new business models to serve these populations, generating both outsized impact and strong financial returns. It also underscores the need to segment the lower-middle-income opportunity by matching the right investors with the right investment opportunities. The notion that "blending" capital of all shapes and sizes - from grants, loans to mezzanine and equity financing - can be a catalytic factor for impact investing has become a hot topic. What are some starting points for anyone interested in this idea? Private Capital for Social Outcomes: Identifying Opportunities for Impact Investment in International Development (Link): There is a growing recognition that markets and the private sector must play a more significant role if we are to solve or at least make a dent in addressing some of the greatest challenges facing developing countries worldwide. 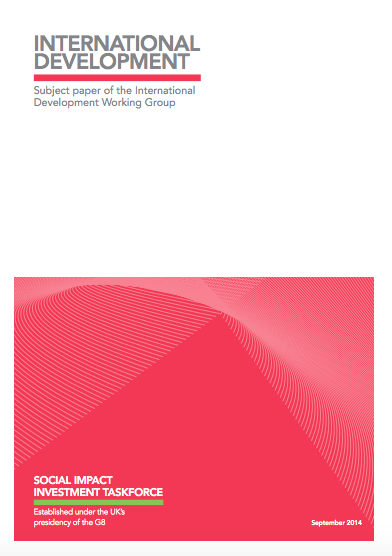 Impact investments – which target social or other non-financial returns along with a financial return, and require measuring the achievement of both – provide an opportunity to bring new capital to developing economies, improve the effectiveness of international development interventions, and advance development using market principles. The report explores the concept of blending private and public capital for impact outcomes to help grow this market and practice. World Economic Forum’s Blended Finance Toolkit (Link): The Blended Finance Toolkit, a product of the Redesigning Development Finance Initiative (RDFI) of the World Economic Forum, is designed to provide an overview of the Blended Finance ecosystem and its benefits, while offering solutions for adopting this approach to finance and investment in emerging and frontier markets. Given this is still such a new space, what about a few pointers for those who are entirely new to impact investing? This guide draws from members of the Toniic Netwrok – a global impact investing network – as well as their peers, and aims to help those with an interest in early-stage impact enterprises see how this work is being done around the world. Impact Investing: A Primer For Family Offices from the WEF (Link): The goal of this primer is to help family offices interested in impact investing to begin to understand how they can put it into practice. It offers useful frameworks and insights for multi-family offices, family businesses, family foundations and high-net-worth individuals as well as policy-makers and advisers.